Washington (CNN) - There will be food, drinks and live music Friday in Missouri – and Sarah Palin will be the co-host. The former GOP vice presidential candidate will serve up barbecue and political red meat at a picnic to support Missouri Republican Senate candidate Sarah Steelman. The "BBQ and Picnic with Governor Sarah Palin" will take place in Cleveland, Missouri, less than an hour outside of Kansas City. It will be Palin's first campaign appearance with Steelman since the former Alaska governor endorsed her some two weeks ago. Since endorsing Steelman, Palin has appeared in a campaign commercial. "Sarah is an economist who defends our tax dollars – like a mama grizzly defends her cubs," Palin says glowingly of Steelman. "I am so grateful to have Governor Palin's support, and very excited to say she will be coming into Missouri to participate in this BBQ," Steelman said in a statement. "I know she will excite folks to come out and take a strong stand against the status quo." As the candidate invited "everyone to attend," her campaign noted in a release that both Steelman and Palin "will be serving the food as a way of saying thank you for all the support and encouraging people to get out and vote." Steelman is locked in a tight three-way race for the right to be the Republican challenger against Democratic Sen. Claire McCaskill. The GOP senate primary is on Tuesday. Steelman's opponents are businessman John Brunner and Rep. Todd Akin. A recent Mason-Dixon poll showed Brunner at 33%, with Steelman at 27% and Akin at 17%. Since losing the 2008 presidential race with Sen. John McCain, Palin has shown herself to have a political Midas touch. This cycle, she has endorsed Sen. Orrin Hatch's re-election in Utah, Deb Fischer in Nebraska, and Ted Cruz in Texas. All of them have gone on to win their GOP senate primaries. But Palin's endorsement record is not without losses. For example, in 2010 her picks lost some of the most high-profile senate races: including Sharron Angle in Nevada, Joe Miller in Alaska and Christine O'Donnell in Delaware. The Tea Party Express has also backed Steelman. On Thursday, it sent out a fundraising appeal stating, "With all of the political world's focus on the Senate election in Texas, which resulted in Tea Party candidate Ted Cruz's victory, the Missouri race has been over-shadowed. We are sounding the alarm that the election is this Tuesday." The Express, along with other tea party backers, waged a months-long campaign on Cruz's behalf in Texas, helping the former state solicitor general beat out GOP establishment, Lieutenant Gov. David Dewhurst. What GOP Senate hopeful is doing so bad that they would want an endorsement from a woman that destroyed McCain's bid for the presidency, quit as governor of Alaska, and hasn't had an intelligent thing to say ever? It's really sad when someone as worthless as Palin is admired. This country is truly gong down the toilet. I at least understand the viciousness of the female liberals, Ms. Sarah makes them look like poor washed out little trolls. 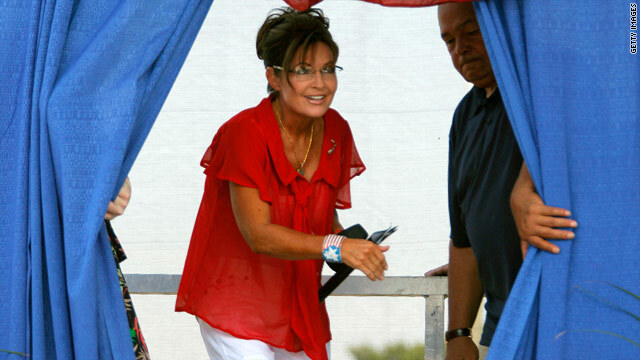 Palin ia a one night stand. Weird photo of Palin. Is she normal? "mama grizzly"....for God's sake, Sarah, say something intelligent. You're wearing that phrase out. But then again, you probably don't really have much new to say, do you? Sarah Palin strikes fear in liberal's hearts. And for good reason. She's one of the few politicians in the modern era to go after big business . . . Republican owned oil. Sarah stands on principle, not failed ideologies. The left should be VERY afraid. American is listening and they are tired of the Marxist trajectory the country is being pushed toward. November will surprise some people. Really, someone wants Palin's endorsement? I don't think that is really a good idea. How do we know that Steelman is really "an economist who defends our tax dollars – like a mama grizzly defends her cubs?" This makes little sense, but the source of the statement is the reason why it makes little sense. So Sarah appears to be instrumental in getting Cruz on the ballot over Dewhurst in Texas. Perhaps people need to look at this little fact: Cruz's wife currently is head of the southwest region in the Investment Management Division of Goldman, Sachs & Co., previously worked in the White House for Condoleezza Rice, and as an investment banker. So what will anybody gain by having more Goldman Sachs influence in congress? If you have not met Gov. Palin, the BBQ in Missouri is the best way. She will be serving food. If you see her give a speech you are part of a large crowd. I went to her speech in Farbanks, where she served hot dogs and was struck by how she gives each person a moment to talk. She makes every person feel important in that moment. Go if you can. You will not be disapointed. YOU PEOPLE are giving this individual way too much credit. After endorsing a lot of candidates, she is sure to pick a few winners. This does not make a king or queen maker.